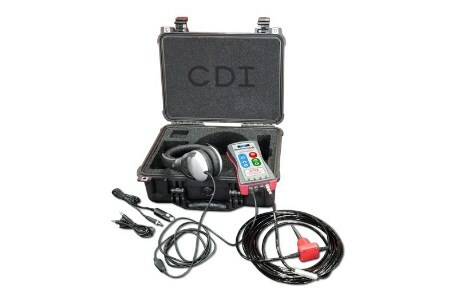 CDI introduces their latest product, SoniTrack XLR. The SoniTrack XLR is an acoustic geophone pipeline pig tracking system that includes a powerful computer-controlled audio amplifier. SoniTrack XLR allows an operator to quickly and easily listen for pigs moving within a pipeline over several kilometres. In addition to industry-standard headphone and AUX outputs, SoniTrack XLR includes a built-in, digitally-tuned FM transmitter allowing for quick and easy wireless broadcast to any number of surrounding vehicles or radios. Waterproof connections and a durable, gasketed, waterproof enclosure ensure that SoniTrack XLR will be chasing pigs with their owners for years to come. The standard SoniTrack XLR kit includes the SoniTrack XLR receiver, wide temperature geophone probe, headphones, AUX cable, cigarette lighter 12VDC power cable as well as a durable Pelican® brand carrying/shipment case. SoniTrack XLR has a retail price of US$1495.00. Discounts are available.